What are the ‘Google+ shares’ and how to retrieve them? Social networks all have different metrics. On Twitter, you can look for the number or retweets, on Pinterest, the number of ‘pinned’ pictures, on LinkedIn, the number of ‘shares’, etc. Facebook is by far the more precise because you can get a number of likes, shares and comments. On Google+, the picture is not so clear yet. In this article we try to understand the different available metrics from Google+ and we give you some code to import the number of Google+ shares in python and PHP. Surprisingly, to our knowledge, there isn’t a tool to show all these numbers in one same place yet. You can get the number of +1 on SharedCount, the number of comments on Terry Simmonds‘ tool and the number of shares using Google Ripples. While the displayed +1 number on your website aggregates all possible social events (plus, reshares), the comments and shares reflects stronger interactions. Typically, the number of comments will include the number of shares and the number of comments made on your post or on a share, whereas, the number of shares will be limited to shares and re-shares only. The +1 signal is really easy to get growing whereas it is more difficult to have a high number of shares/comment without a great content. Some month ago, a small bug impacting on Google+ comments has been discovered by Terry Simmons who contacted the Google+ team for a fix which arrived some time later. However this bug seems to be still active when you use Ripples. It is usually pretty easy to use Ripples to get the number of shares : https://plus.google.com/u/0/ripples/details?url=[your_url] but because of the bug, your website URL might not be the one saved correctly when it is shared on G+ by someone. When someone posts a link on Google+, an extra parameter (sid) is sometimes added. If you cannot find all the expected shares, you should try adding a parameter at the end of your URL : %23__sid%3D0 (#__sid=0) or %23__sid%3D3 (#__sid=3) . On the URL I used for a test, I can find shares for sid=0 and for sid=3 and no shares for the standard url. How to get some ‘Ghost’ shares ? When you submit a post on G+, only the initial content is saved on Ripples. If you later edit your post and remove or edit the initial url, it will NOT be updated in Ripples. While doing my tests I thought that a bug was present and tried the following : first sending a post with my URL to G+, then removing the URL, and later asked some friends to share the edited post. I expected to see the number of shares growing. But finally it’s not the case. You cannot get ‘fake shares’ but you can however share a post with a ghost link. That is the reason why I re-named this section ‘ghost share‘. If you post a link together with a picture (first put the link, wait until the excerpt is loaded then removed the excerpt) you can get more attention from readers, and more reshares and +1. 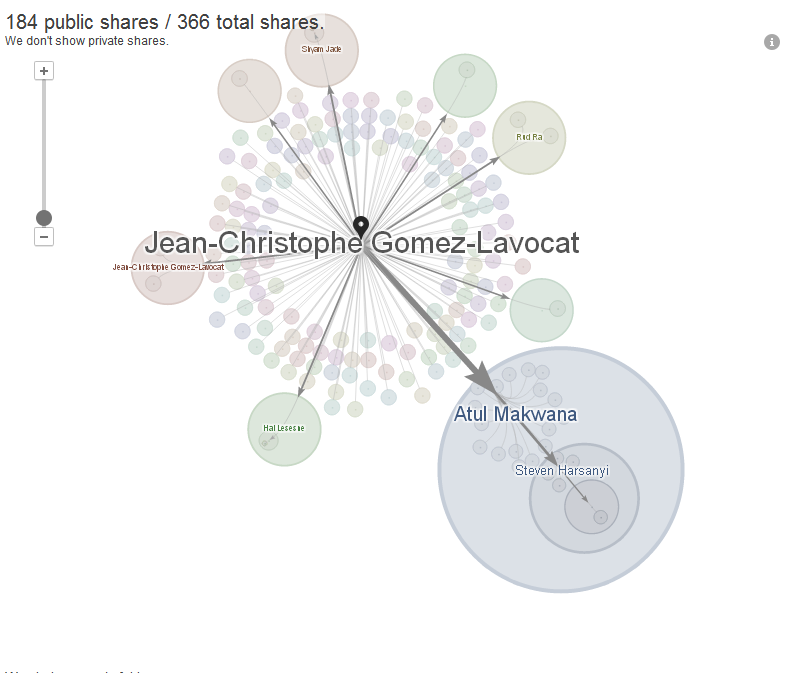 The number of +1 will be attributed to your link, but it is not the same story for shares. In the case of a share, your URL has to be the only ‘rich element’ present in the body of the post. If you have a link with a picture, it will not count as a share (because you have remove the link’s description to put the picture). So to get some reshares, you need some great content . When you check on Ripples a post, you can get the number of public shares but also the number of private shares, namely the total shares. In the case of URLs, only the number of public shares is provided. Google states clearly “we don’t show private shares” and probably does not take them into account to avoid spam. Be sure to always share your link publicly. During my tests, I found a really funny situation and I don’t know how to interpret it. For one of my test link, there was two contradicting data : the number of shares (indicated on the left) and the list of shares on the right, which was clearly not equal to the number indicated on the left. How many shares can you count on the right? Four or five? If someone understands this point, I am really curious to get your opinion as a comment below. What happens if you send a post with several links? For the sake of fairness, I was expecting to see a share added for every single URL, but this does not seem to be the case. I did not spend too much time on this test, but you are welcome to post your results in a comment below. So, to summarize, when you share a post with several links, only the first one receive a share ! When I write the “first one”, I mean one from which Google+ extracted the content/picture for the small excerpt at the bottom of your post. Let’s say you are a blogger and want more data about your articles. You can check all your posts one by one or you can try using WordiZ. There you will get more metrics associated with your articles (the ones you tagged with rel=”author”). Signup now for an early invitation, we need some extra members to launch our beta.